You may or may not know that St. Francis (San Francesco d’Assisi) is the patron saint of Italy (as well as the patron saint of animals and the environment). St. Francis holds a special spot in the hearts of Italians and to this day it’s a popular name for boys in Italy. Although St. Francis’ Feast Day was October 4th, this weekend he will be celebrated in Monterosso by the Capuchin friars and the local population. 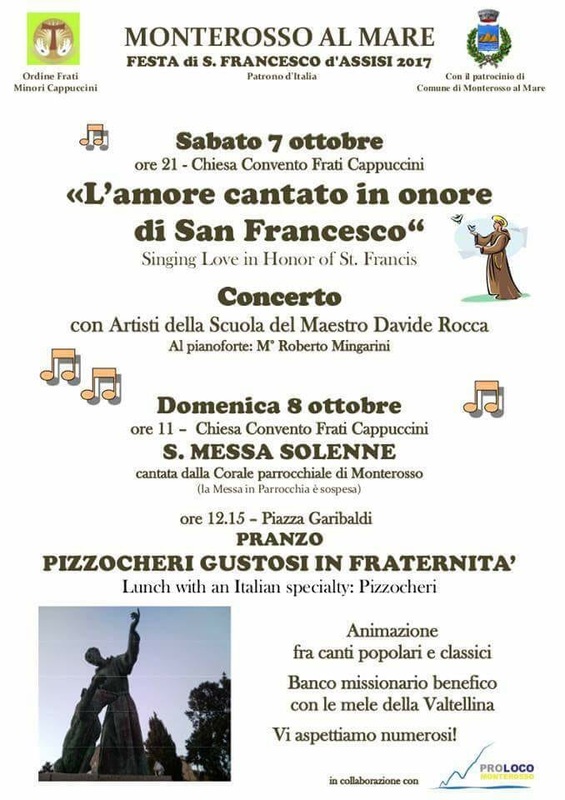 At 9pm today (Saturday, October 7th) a free concert will be held in honor of St. Francis at the Monastery of Capuchin Friars in Monterosso. At 11am on Sunday, October 8th, a special Mass will be held in the same location. At 12:15pm on Sunday a lunch will be held in Piazza Garibaldi in Monterosso with live entertainment and a missionary fundraiser present. The Capuchin friars have been a part of Monterosso since the creation of the village and they are well-loved and respected by locals. The festivities celebrating St. Francis are a tradition and rekindle comradery between the friars and residents of Monterosso. If you’re in the Cinque Terre this weekend, this is a great cultural event you won’t want to miss!